I have recently purchased an Arduino Nano 3.0 Clone which came without a bootloader. I am sure there are many other people who are in the same situation as me, and may have freaked out a little bit at first ! Don't worry, in this instructable I will show you how to easily install a bootloader to your new clone. They are extremely cheap, I have seen pinless nano boards as low as $5 online. You just have to do some work on your end, which is a very fair give and take if you ask me. I don't want to advertise any names here, if you just search the board that you want with the word clone next to it, you will find some. Mine is called Funduino Nano, which is an open source company apparently just making amazing products at real fair prices..
Look how small an arduino nano is, it's the size of my pinky finger. This will help me tremendously in my new projects, huge improvements on size! Step 2: Test It First ! Plug it to the computer with the USB cable. Make sure it turns on, and yes it did.! So far we are safe. You will most likely get the error in the second picture. This has nothing to do with the code being right/wrong. It just simply means that your computer and the board aren't communicating correctly, in our case the lack of the bootloader prevents us from doing so. Now you need to find a working arduino board, doesn't matter if it is a nano or not, I have used my "real" uno r3 and worked perfectly. If you don't already have one, try borrowing it from a friend. If you have any grab your female - male breadboard jumpers. These will make the process even faster and easier. BUT I didn't have any so, instead of waiting 2 weeks for them to arrive online as well, I had to take some extreme measures! -Connect the working arduino to your computer. - Now connect the two arduinos together, to do this without female-male jumper cables was time consuming, you have to be VERY CAREFUL and take your time bending the wires, other wise you may short your circuits. ask me first ! In the second picture you can see that first I put the ICSP pins through a piece of paper and then carefully wrapped around them the corresponding wires. Make sure they grab on very tightly, use a small flat head screw driver to bend them. Take your time, don't be rough. if you want to learn more or get a second opinion you can check this post (it's amazing) or just search on google " how to install a bootloader to arduino clone " and you will see many articles on this very topic. Remember to check out my other posts and subscribe to stay in the loop..! Add the schematics from this instructable. I seem to be a complete moron for overseeing this issue and cursing at the nano. He has a drawn schematic on how to connect this. Nice work indeed! I got 4 Nano -clones, all born with the blink -sketch from factory, 3 of them unable to program at all, 1 of them allowed programming one time only. After following this tutorial, they are all up and running. Seems like the factory just program the blink -sketch direct in .hex, not thinking about bootloader and fusebits. Thanks! Your procedure will also work with the Mini Pro clones. hey there, I tried the same procedure but wanted to fix an arduino uno through arduino nano. Result: Both of them stopped working, when i go to board info(for nano), it shows unknown board. How should I fix it? Thanks! This did it. Wasted half a day googling for answers and this finally did it. Thanks for this Nano boot loader fix. boot loader, I put it up and forgot about it. Then I found this fix! The only thing found was I needed to set the programmer to be "Arduino as ISP" and press the reset button on the NANO and release it just before burning the boot loader. I tried to restore the bootloader at my Arduino Nano. It was working before but suddenly i can't compile a programm anymore. During compiling proces it hangs..
Arduino: 1.8.5 (Windows 10), Board:"Arduino Nano, ATmega328P"
"Uitgebreide uitvoer weergeven tijden compilatie"
optie aan in Bestand -> Voorkeuren. Is my Arduino Nano "gone" ?? Tip for noobs like myself. If you cant upload sketch and 13pin led does not blink at all after pressing reset = possibly dead bootloader. Had to spend some time to figure that out. Thanks for this very helpful tip/procedure. I struggled for the day thinking I had somehow destroyed my NANO clone. After reading others like issues, I found this article. Now I can continue my exploration on the smaller scale boards..
many thanks, i bought a arduino nano clone from china, and they didn't burnt bootloader on it, and it was stuck on uploading, i followed your method and it worked for it. I just followed these instructions and they worked perfectly. 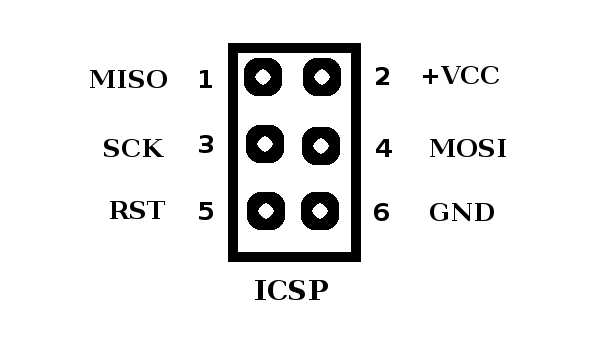 I was going to mention that you don't have to use the ICSP header because all of the pins on this header are connected in parallel with existing pins, but it seems MilosG7 beat me to it (by a about a year). What to do? Is this still a problem of the program that is still active? The selected chip is correct, the chip describes this. I use a Nano with the ArduinoISP program which is a ATmega328, is this a problem? Thank you for the test it part! I just thought it would not work because its a clone but it actually had a bootloader. Thank you so much, I have been struggling with this problem for weeks. The other tutorials were not working for me but this one turned my paperweight Arduino into a useful device.